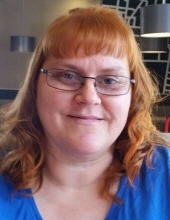 Robin Ann Slone, age 48 of Wayland, Kentucky, passed away on Saturday, March 16, 2019 at Pikeville Medical Center, Pikeville, Kentucky. She was born April 30, 1970 in Willard, Ohio to Carol Oney Fox of Willard, Ohio & the late Jimmie Wright. She was the wife of Ishmell Slone. She was a disabled nurses aid. Along with her mother and husband she is survived by her Daughters: Kayla Slone & Jaimie Slone both of Wayland, Kentucky; Brother: Melvin (Caraleah) Wright of New Washington, Ohio; Sister: Karen Wright of Delaware, Ohio; Nieces & Nephews: Denver Wright, Aubrey Garverick, Allison Wright, Sarah McDorman, Shannon Hunt & Amanda Shenefield. She will be missed by all that knew and loved her. "Email Address" would like to share the life celebration of Robin Ann Slone. Click on the "link" to go to share a favorite memory or leave a condolence message for the family.